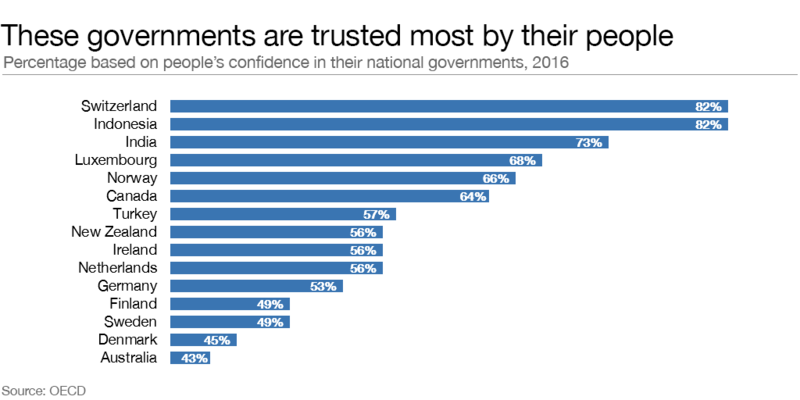 In Greece, only about one in 10 citizens trust the government. Across much of the West public confidence in government is plummeting, but in some countries it’s a different story. Prime Minister Narendra Modi heads one of the world’s most-trusted governments. Almost three quarters of Indians say they have confidence in their national government. This is compared to only about one third of Americans. The situation is even worse in Greece, where only about one in 10 citizens trust those in charge, according to a new report by the OECD, Government at a Glance, which looks at people’s confidence in their national government. Factors influencing whether we trust our governments or not include the state of the economy, political upheaval, and headline-grabbing events like major corruption cases. So India’s recent anti-corruption and tax-reform drive could help explain the high levels of confidence in the government. Greece, on the other hand, has had more than its fair share of problems in the past few years. It has an enormous debt burden, and relies on bail-outs from the Eurozone to prevent it from going bankrupt. These loans come at a heavy price, though, requiring deep cuts to pensions and public services. In May protesters clashed with police in central Athens as the Greek parliament approved a new package of austerity measures. In addition, Greece has experienced huge pressure on its resources as a result of the influx of migrants trying to get to Europe, many of whom are fleeing war zones. The United States emerged last year from an acrimonious election campaign fuelled by fake news – a phenomenon that has undermined people’s trust in the media and politicians. In Europe, Turkey, which is cracking down on the media and jailing opposition figures following last year’s failed coup, gets a remarkably high score of 58%. By contrast only 30% of Spanish and 28% of French citizens trust their governments. Should we trust governments’ fiscal plans? Trust also relies on the public’s opinion of their leaders. For instance, Canadian Prime Minister Justin Trudeau exploded onto the world stage two years ago with a highly optimistic and open-minded view of his country’s future, which could help explain Canada’s lofty position on the list (almost two-thirds of Canadians trust their government). There was a global backlash after the financial crisis of 2008, with many feeling that governments were working too hard for the few and not hard enough for the many. This led to a wave of populist sentiment across the globe, and a fall in trust in governments. The number of people expressing trust in their governments across the OECD in 2007 was 45%. It’s now down three points to 42%. The countries that have experienced the greatest loss of trust are Chile, Finland, Greece and Slovenia. Trusting our government is in our own interest because it supports economic growth. The more people trust their government the more they are likely to invest and spend, which boosts the economy. Official policies and initiatives are also more likely to work. For instance, people are more likely to pay their taxes and comply with regulations if they trust their government. This is particularly true when people are asked to make sacrifices – such as austerity measures – for the common good. Governments must do more to win back their citizens’ trust, says the OECD. They need to start putting more money into public services, and become better at meeting the needs of the entire population, including in healthcare, employment and education. They also need to make sure that all their citizens can access government services.